The Bozburun (“gray cape”) site lies at the base of a cliff, called Küçüven Burnu, on a sloping, sandy bottom. The visible portion of the site is a mound of amphoras approximately 20 meters long and 8 meters wide, although there are many artifacts lying in the rocks of the cliff face. The amphoras appear to be of two major classes common toward the end of the 1st-millennium A.D. The dominant class, are often referred to as “pyriform” (pear-shaped) or “ovoid” (egg-shaped). The site has long been known to Turkish sponge divers and was shown to George Bass during INA’s first survey in 1973 by a diver from Bozburun, Mehmet Askin. During the first season of excavation, initial topographical mapping of the site was completed, along with the establishment of primary datum points and a grid of 2-meter squares. Some excavation was carried out in a few of the squares that had visible remains, but in no place was the bottom of the deposit reached. In 1996 work concentrated on the upper half of the site, although Dave Stewart and Korhan Bircan continued their work on lower squares. In addition to many amphoras, small finds included galley pottery and a glass goblet were recovered. Removal of much of the broken material from the upper end revealed a large area of amphoras still stacked in the bottom of the hold, running from square F11 down to H11. H11 also contained the first coherent hull remains we encountered. Although only a small area was exposed, this included the keel, four frames, four bottom strakes, a stringer and ceiling. In 1997 nearly 500 amphoras were removed from the site, and approximately 175 of these were stored on the bottom, off site. Hocker, Fred. 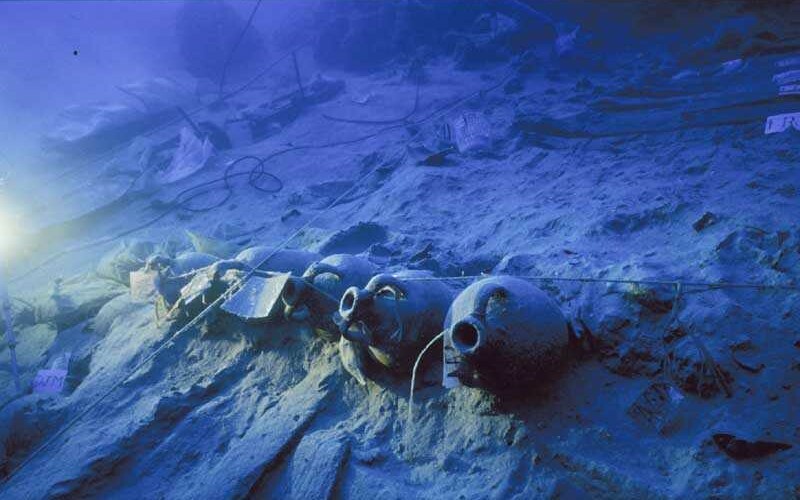 “A Ninth-Century Shipwreck near Bozburun, Turkey.” INAQ 22:1, 1995. Hocker, Fred & Michael Scafuri. 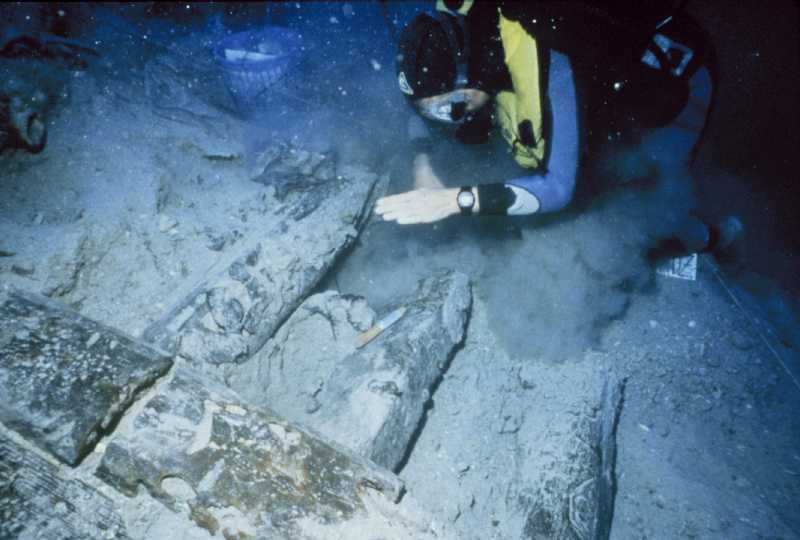 “The Bozburun Byzantine Shipwreck Excavation: 1996 Campaign.” INAQ 23:4, 1996. Harpster, Matthew. “A Re-Assembly and Reconstruction of The 9th-Century AD Vessel Wrecked Off the Coast of Bozburun, Turkey.” Ph.D Diss. Texas A&M University, 2005. Hocker, Fred. “Sampling a Byzantine Vintage: Bozburun, Turkey,” in “Beneath the Seven Seas,” edited by George F. Bass, pp. 100-105. New York and London, 2005. ABOVE: Archaeologist hand-fans to uncover the hull (Photo: INA).